Closet Clean Out - The Mrs. & Co.
As spring has sprung so has the warmer weather and Dia & Co. inspired me to get a jump on my closet clean out. Now for me this year since I'm pregnant I'm double cleaning out. I still could wear some of my regular winter clothes when I was early pregnant, but now that the bump is growing, I'm pretty much in all maternity. So the first thing I did was move out ever piece of clothing that wasn't maternity or that I knew I couldn't fit in. It just helps being able to see what I actually have to wear instead of sifting through it all. As a rule of thumb when I'm not pregnant, I stick to these guidelines as I get ready for a new season, whether it's warm or cool. 1. If it doesn't fit with the season, move it out. We have these gigantic cedar closets in our attic so I move all my clothes that don't fit in the season up there. Honestly, there's no reason to have any long sleeve shirts in your closet. They won't get worn when it's hot outside. 2. If you didn't wear it last season, time to chunk. As you are pulling last season's clothes out, really take a good look at it. Did you wear it? If you didn't wear more than 3-4 times, it's time to either sell it or donate it. I promise you won't "eventually" wear it. We never do! Now that all of season's clothes you may wear are visible, do the same thing. Will you wear it? Do you like it? Try it on. See if there's something else in your closet it can be paired with. If not, time to say bye bye. 3. Organize what you have. I have found if I just throw them all up and don't have them organized I forget what I have. You can either organize by color or organize by type. I like to organize by type (shirts, tanks, fancy tops, pants, dresses). That way when you feel like a tank and jeans day, you go right to those areas, see what you have, and pick out an outfit. I do my closet clean out at the beginning of spring and normally beginning of fall once it really cools off. I switch out my clothes and clean them both out. Donating what I know I won't wear again. 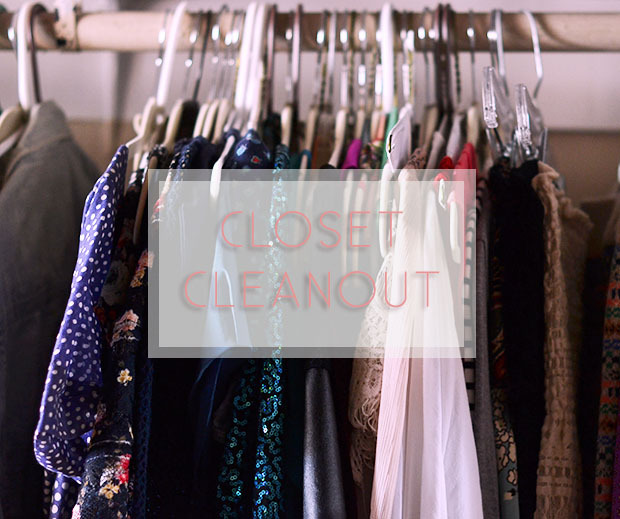 I'd love to hear how you keep your closet organized and neat! Leave a comment with your tips and tricks! Stay tuned for another post about the must have items in my closet for spring time! I will be including links to those pieces so they'll be easy for you to snag.